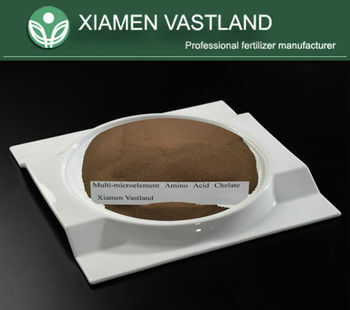 It is based on multi kinds of amino acids, utilizing its enormous surface activity and adsorbing and holding capacity, adding iron, zinc, manganese, copper, boron, magnesium, potassium for plant growth. It can ensure not only its major elements of slow-release and adequate utilization, but also keep stability of trace elements and long-lasting effect. Soilless culture: Diluted to 10-30ppm. It must be kept in airy, cool, dry places, far from sources of heat/ignition and protected from sunlight.